A couple of days ago, Politico ran a piece about how Scott Walker is wrapping himself in all things Midwest as he prepares to launch his presidential campaign. He talks about Kohl’s, courts donors from Chicago, is focusing on winning the midwestern primaries, etc. 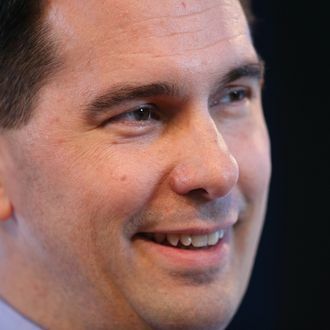 But the story missed the biggest midwestern bona fide in Walker’s repertoire: rampant passive-aggression. As the Washington Post tells it today, Walker has launched an offensive against Marco Rubio in the most polite way possible. He’s telling everyone that the Florida senator should be his VP. Over the past several months, Walker has routinely discussed Rubio in private meetings with supporters and potential donors. The governor praises Rubio and all that the senator can bring to a presidential campaign but does it in a way that casts Rubio as more lieutenant than general, according to several Republicans with knowledge of the conversations. That’s some expert negging from Walker, who’s not just putting down Rubio in the eyes of donors and voters, but is also acknowledging that the senator brings something he doesn’t. Namely, an inherent appeal to Latino voters. That kind of diversity on the ticket could be particularity useful to a white male running against Hillary Clinton in the general election.